These bumps include Brexit uncertainty; slowing growth in China; the unraveling of once-thriving emerging markets such as Brazil and Venezuela; a highly indebted global banking system; geopolitical adventurism by Russia; the U.S.-China trade war; continuing turmoil in the Middle East; and rising interest rates. And let’s not forget the worsening political mayhem in Washington, DC. The nation’s capital increasingly resembles not a global power center, but an unsupervised kindergarten. But take a deep breath and step off the ledge. Even in the beleaguered technology sector, you can still find reasonably valued stocks with strong growth prospects. One tech stock that appears to be a promising bargain is Micron Technology (NSDQ: MU). Is this chipmaker a good bet for 2019? Or when it comes to tech stocks, should you simply get into a “defensive crouch” and flee to safer assets? Let’s see if you should buy or shun Micron. Based in Boise, Idaho, Micron Technology provides semiconductor systems such as dynamic random-access (DRAM) and NAND products for computers, servers, networking devices, communications equipment, consumer electronics, and industrial applications. Micron (market cap: $34.6 billion) is targeting hot tech areas such as autonomous cars, artificial intelligence (AI), machine-to-machine (M2M) learning, the Internet of Things (IoT), virtual/augmented reality (VR/AR), and the cloud. Over the past 12 months, Micron has lost 27.2% and the S&P 500 has lost 8%. Over the past two years, Micron has lost 40.9% and the S&P has gained 10.2%. Over the past five years, Micron has gained 47.3% and the S&P 500 has gained 34.7%. How Has Micron Performed In 2017/2018? In 2017, Micron gained 82.3% compared to a 19.4% gain for the S&P 500 (see chart). In 2018 year-to-date, Micron has lost 29.2% and the S&P 500 has lost 8.4%. Advanced Micro Devices, based in Santa Clara, California, develops computer chips and related technologies for business and consumer markets. AMD’s core products include microprocessors, motherboard chipsets, embedded processors, central processing units (CPUs), and graphics processing units (GPUs). With a market cap of $17.8 billion, AMD is the world’s second-largest chipmaker. With a mammoth market cap of $210.8 billion, Intel is the largest maker of semiconductors in the world. However, the migration away from PCs toward smartphones has hurt the company. Intel’s PC business remains its biggest operating unit, accounting for two-thirds of sales. Intel is likely to continue its dominance of the PC microprocessor market over the long haul, thanks to a strong R&D budget. Qualcomm (market cap: $67.8 billion) is a semiconductor and telecommunications products maker. The company is divided into two divisions, Qualcomm CDMA Technologies (QCT) and Qualcomm Technology Licensing (QTL). The company’s ownership of this intellectual property means that whenever a manufacturer sells a handset that delivers high-speed data connections, Qualcomm reaps a royalty on the sale, regardless of the device’s brand. Will Micron Go Up In 2019 (Should You Buy)? Micron’s business, like the semiconductor industry as a whole, has typically been cyclical. 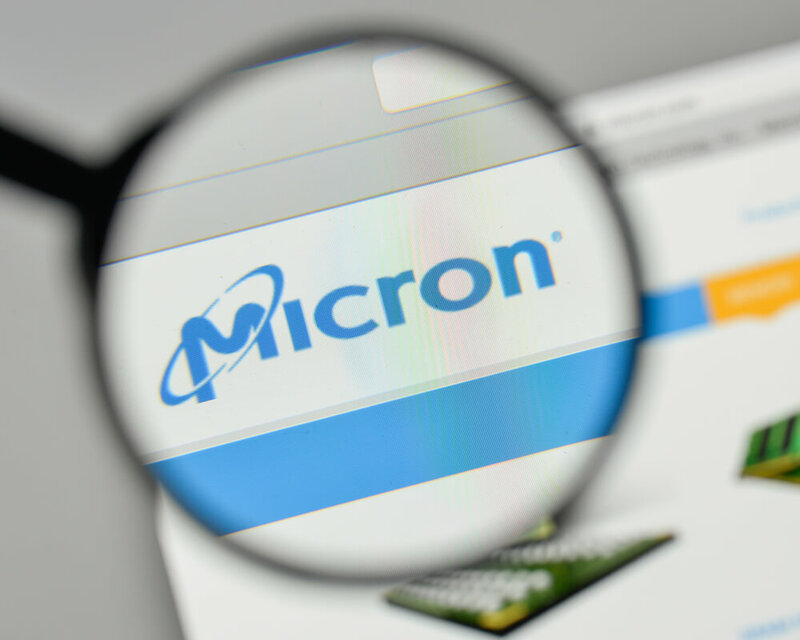 In 2019, however, demand for Micron’s sophisticated products will be less susceptible to the ups-and-downs of the economic cycle, making the stock inexpensive at its current level. One aspect pointing to lower cyclicality is Micron’s entrenched foothold in the Asia-Pacific region, its biggest market and an area comprising 43% of global demand for 3D NAND flash memory. 3D NAND flash memory is the new standard that meets the high-capacity, high-performance requirements of the latest smartphones, tablets, laptops, and VR/AR gear. The overall NAND global market is projected to reach about $39 billion in annual revenue by 2022, as OEMs in the PC and smartphone markets upgrade the storage specifications of new products. Another advantage is Micron’s foray into the fast-growing IoT cybesecurity market, which is projected to grow to $36.9 billion by 2021. The company has partnered with Microsoft (NSDQ: MSFT) in developing a product to protect IoT devices from hackers. Microsoft applies Micron’s proprietary cybersecurity technology, Micron Authenta, to ensure that only trusted hardware devices gain access to Microsoft’s Azure IoT cloud environment. Microsoft reports that more than 5 million organizations use Azure cloud services, with new subscriptions pouring in at 120,000 per month. The Microsoft partnership provides Micron access to a huge and growing customer base with an urgent need to protect data from the growing cyber threat. Micron’s strong positioning in the booming Asian market coupled with its Microsoft alliance in the cybersecurity niche should ease vulnerability to business cycles. That makes Micron a tech company with strong growth prospects even if the global economy slows in 2019 as widely expected. Will Micron Go Down In 2019 (Should You Sell)? Let’s not ignore the bear case against Micron. Tech stocks led the rise of the stock market in 2017 and most of 2018; they’re now leading its decline. The Silicon Valley stars touted on financial TV shows got way ahead of themselves, sporting nosebleed valuations destined for a fall. Interest rates are rising and headline risk is worsening. The global economy is slowing and investors increasingly doubt the competence of political leaders. Many analysts predict an economic slowdown in 2019 and the stock market already is flirting with bear market levels. The bull market and economic recovery are both long in the tooth; financial and economic laws have not been repealed. Investors are overdue for a prolonged slump in share prices. Most companies won’t be immune, especially tech stocks that have been media darlings for such a long period of time. The semiconductor industry in particular faces a possible glut combined with slackening demand. When it comes to Micron and its singular attributes, I’m siding with the optimists. A pillar of the bull case: During its recently concluded 2018 fiscal year, Micron posted $14.1 billion in net income on $30.4 billion in revenue. To be sure, the stock market has swooned in the latter part of 2018, but conditions remain in place for a technology sector rebound because inherently strong tech stocks have gotten oversold. Large-cap “story stocks” in the tech sector have led recent sharp declines on Wall Street. Non-FAANG players such as Micron, however, are better positioned to survive and thrive in 2019 due to solid fundamentals, product differentiation, and reasonable valuations. Continuing apace are breakthroughs in cloud computing, Big Data analysis, AI, autonomous vehicles, digital personal assistants, and the IoT. These trends are tailwinds for Micron. In addition, the U.S. is on the cusp of widespread deployment of 5G ultra-fast wireless networks. This deployment will accelerate in 2019, lifting the tech sector as a whole as demand booms for handheld gadgets and chips that provide greater memory. Despite political chaos in Washington, DC and concerns over rising interest rates, economic growth in the U.S. remains on track. U.S. gross domestic product (GDP) grew 3.3% on average in the first nine months of 2018, exceeding the Trump administration’s target growth rate of 3%. The fourth quarter appears to have maintained this momentum. The average analyst expectation is for Micron Technology to post earnings growth over the next five years of 24.9%, on an annualized basis. And yet the stock’s 12-month forward price-to-earnings ratio is an absurdly low 4.1, due to overwrought concerns about a possible slowdown in chip demand. Micron Technology is a value play that can buffer your portfolio from the bumpy rides to come.